Sometimes it’s just not your day. Cole Hamels had a bandage on his chin, perhaps from his morning shave or maybe he tussled with a particularly aggressive pimple. Things seemed to turn around when he effortlessly snared Marco Scutaro’s comebacker for the first out of the third. But in the next inning a hot shot off Adrian Gonzalez’s knocked off Hamels’s glove and then knocked the Phillies’ starter off the mound. With Hamels out of the game getting his hand x-rayed the Red Sox made hay. Long reliever David Herndon gave up a triple to Josh Reddick with one down in the fifth and the replacement outfielder scored easily on Drew Sutton’s ground ball single to right. Scutaro singled and advanced Sutton to third. With runners at the corners and one out Jon Lester didn’t pull a John Lackey in the batter’s box but neither did he strike out. The lineup turned over to Jacoby Ellsbury, who sent a wormburner to the opposite field to plate Sutton. Jason Varitek clouted home runs in the sixth and eighth, but since Dustin Pedroia also hit a four-bagger it was the second baseman’s hit that was most people heard about. Particularly because it was an opposite field homer with Pedroia batting clean-up. “He’s small in stature, but not in his own opinion of himself,” said Terry Francona. Francona reached a significant milestone: this victory marked his 700th win with the Red Sox. Ironically it came in the city where Francona had very little success (285-363, or a .440 winning percentage) but at least got his first taste of managing a major league team. Sort of how Bill Belichick had to fail in Cleveland (36-44) before finding success with the Patriots. Thanks for breaking in two of our best coaches, Philly and Cleveland. You’re like baby Massachusettses. Although the Red Sox came away with a meaningful and much needed win it was not without a shadow of sadness. Mike Cameron, a 17-year major leaguer, was designated for assignment. Were it not for that foul ball finding Kevin Youkilis’s leg Cameron may have lingered longer, but sometimes veterans have to be shown the door when they don’t make their own exit. 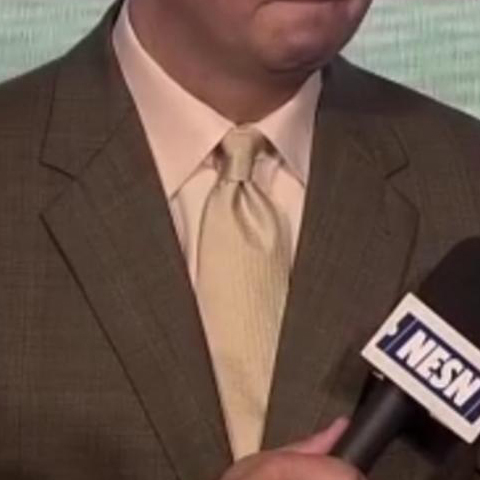 Earth tones just don’t work for Don Orsillo. He needs to go back to blues, greys, and black.